Attitudes have been a central topic in social psychology from its early beginnings. But what exactly are attitudes, where do they come from, and how can they be modified? The overall aim of Attitudes and Attitude Change is to provide students with a comprehensive and accessible introduction to these basic issues in the psychological study of attitudes. In four parts, readers learn about how attitudes can be measured, how attitudes are shaped in the course of life, how they are changed by other people, and finally, how attitudes in turn affect our thoughts and behavior. This completely revised and updated second edition covers many recent developments and reports cutting-edge research while also addressing the classic findings and theories that advanced the field. In addition to integrating the newly emerged topics of implicit attitudes and recent models regarding the coexistence of explicit and implicit attitudes, this edition also adds chapters on social influence and resistance to persuasion. This comprehensive and user-friendly book carefully balances theoretical underpinnings and empirical findings with applied examples to enable readers to use the insights of attitude research for practical applications. Critical discussions also instigate readers to develop their own thinking on key topics. 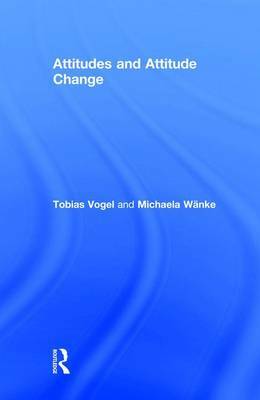 Buy Attitudes and Attitude Change by Tobias Vogel from Australia's Online Independent Bookstore, Boomerang Books. Tobias Vogel is a psychologist primarily interested in the questions of what, how, and why. His research focuses on social cognition with an emphasis on judgment, decision making, and evaluation. After his dissertation on persuasion, he studied and taught social and consumer psychology in Germany and Switzerland. He currently works as a research fellow at the University of Mannheim, Germany, and blogs about psychological phenomena of public interest. Michaela Wanke has interests in various fields of social cognition and the intersections of social cognition and consumer and political psychology. Her research areas include persuasion, fluency, social judgment and attitude measuring, among many other topics. She held a chair for social psychology at the University of Basel, Switzerland, from 2002 to 2011 and currently holds a chair for consumer and economic psychology at the University of Mannheim, Germany.